I’m always reluctant to call recipes the “best ever” because there’s always a chance I could be wrong. But I’m just going to come right out and say it. This is the best Spinach Artichoke Dip I’ve ever had. I think what sets this version apart from the crowd is the the absence of cream cheese. Don’t get me wrong, I love cream cheese. 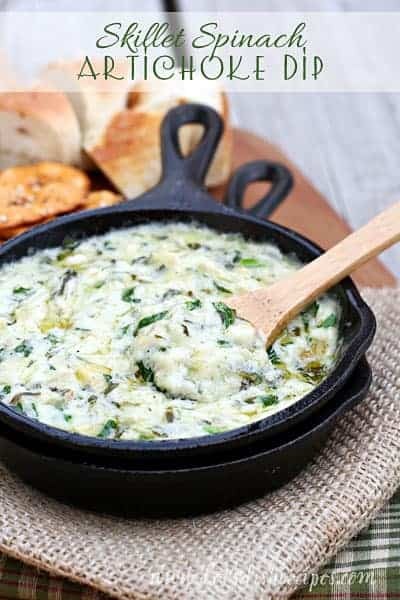 I love spinach and artichoke dip made with cream cheese. But this decadent dip starts with a rich, buttery cream base–almost like an Alfredo sauce. It’s so much better than the cream cheese version, and it just gets better from there. I also love that you just mix everything up on the stove-top and serve. I like to leave mine in the skillet and dip right from there, but you could certainly transfer it to a pretty serving dish once it’s all hot and bubbly. Or if you prefer, it can be made ahead, refrigerated, and warmed up in the microwave. I find that this dip heats up best on the stove-top or in the microwave, so I don’t usually put it in the oven. If you go that route, you’ll definitely want to give it a good stir before serving. You can also use frozen spinach in place of the fresh (you’ll need 15-20 ounces), just make sure it’s well drained and you’ve squeezed out any excess moisture. But seriously. 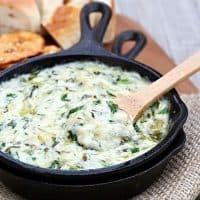 Best spinach artichoke dip ever! Heat the butter in a 10-inch skillet over medium heat. Add the garlic and onions and saute until soft, 3-5 minutes.Stir in the flour and cook for a few minutes more. Slowly whisk in the cream until smooth, then stir in the chicken broth. Add the chopped spinach. Cook and stir until the spinach is wilted. Bring to a simmer and add the Parmesan cheese, lemon juice, hot sauce, salt and pepper. Stir until cheese is melted. Stir in sour cream, artichoke hearts and Monterrey Jack cheese. Cook for a few more minutes, until hot and bubbly. Serve immediately with bread, crackers, chips and veggies for dipping or refrigerate and reheat in the microwave at 50% power before serving. Who Dished It Up First: This recipe was passed along by my friend Ashlee. I am so sorry, Danelle. I turned my nose up at first sight because there was no cream cheese in this recipe. It kept calling me back, though. You are right. BEST EVER! We made this for Super Bowl Sunday with plenty leftover. So I bought a hearty sourdough loaf at the store a few days later and made grilled sandwiches with this stuff (plus some extra italian blend cheese for “glue” purposes). I’ll say it again… BEST EVER! This looks amazing. Next girls night I’m making this! 1 quart = 4 cups, and I’d say this recipe makes about 4 cups of dip.